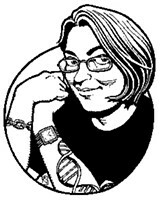 Geek Grrrl: Cyber philosopher Annalee Newitz worries about Big Brother, and you should, too. I first met Annalee Newitz in the summer of 1997 while working on my master's thesis at San Jose State University. Famed mathematician and cyberpunk science-fiction author Rudy Rucker sat on my committee, and after I complained to him that no one would listen to all my crazy ideas, he told me to contact Annalee. She had recently interviewed Rucker for her anarchist magazine, Bad Subjects, so he kicked me in her general direction. "So I'm the one that's supposed to be receptive to all your crazy ideas?" she said over the phone. "I guess so," I answered. Nowadays, Newitz sets up shop as the media coordinator and policy analyst for the Electronic Frontier Foundation while cranking out a syndicated weekly column called "Techsploitation," an award-winning chronicle of haute geekdom she launched in 1999 for , Silicon Valley's weekly newspaper. On April 28 at the Mill Valley Community Center, Newitz will take part in a cutting-edge science and technology panel session titled "The Future of the Future: The Next 10 to 30 Years," the second in a series of public forums sponsored by NeoFiles, an online exploration of edgy, visionary philosophy, science and technology. The panel includes virtual reality godfather Jaron Lanier, San Francisco Chronicle journalist David Duncan and Eliezer Yudkowsky, director of the Singularity Institute for Artificial Intelligence, a Palo Alto-based organization founded for "the pursuit of ethically enhanced cognition by creating beneficial AI." Legendary cyberculture impresario R. U. Sirius moderates the whole shebang, and the group will explore the changes that can be expected throughout the next few decades. I recently ambushed Newitz over the phone to ask what she intends to discuss at the forum. "I'm going to be talking about how current trends in location technologies and also other kinds of online surveillance have the potential to create a future where we have no expectation of privacy," she said. "And at the same time we also have our creativity, our ability to make creative works, really curtailed. Because we're unable to speak out without being identified--because so much creativity relies on anonymity or partial anonymity--we're going to see this kind of unholy alliance between copyright holders who want to make sure their work isn't being stolen and the government that wants to keep track of what everyone's doing so we don't become terrorists. It will create a situation where we have a very stagnant pop culture. And also, a population that doesn't have a way of finding privacy." Which makes one immediately ask how folks will be able to circumvent such a destructive scenario. "There's a lot of different ways," Newitz explains. "There's traditional modes of activism where people can try to fight legislation that threatens to create greater surveillance states on the Internet. But also, people need to be thinking about designing tools that protect peoples' anonymity, and think about designing networks where people can share information without being tracked, and creating machines that allow us to maintain our privacy while still allowing us to speak out. "The guy who's organizing this panel, R. U. Sirius--he writes under a pseudonym, and part of his creativity is connected with his ability to have this kind of identity that's separate from his real-life identity. We need to develop technological tools to protect people who want to be creative." Annalee Newitz, Jaron Lanier, David Duncan and Eliezer Yudkowsky join R. U. Sirius at the NeoFiles Public Forum on the topic of 'The Future of the Future: The Next 10 to 30 Years,' on Thursday, April 28, at the Mill Valley Community Center. 180 Camino Alto, Mill Valley. 7:30pm. $10. 707.773.3175.